A developing progress report on a venture where the outcome is rather uncertain. Any comments, suggestions, encouragements, or discouragements are welcome. For some time I have pursued a reactionary project to supplement my organ MIDI control with a punched paper tape reader. Apart from being old fashioned there are a number of problematic issues with this, like making the tapes, feed them reliably over the tracker, and keep hygroscopic size variation under control. The main positive feature is that of its visual impact, the solid demonstration of how the organ is controlled. Also, in my yet limited experience, the presently weakest link in the system is indeed connected to the electronics system, like diskette read errors causing abrupt music halts, or inconveniently complicated multiple control button pressing. The following covers some key issues of this project, some of which are almost solved, others still in a planning stage. Conventional self playing organs use either pneumatically read paper tape rolls, or fanfold cardboard books sensed by mechanical means. The aim in this project is to combine positive features of each, namely to use fanfold paper tapes, inspired by the DEC computer tapes of the 1960s. These paper books will then be very compact to store and there is no call for return spooling. These are to be read pneumatically, but a main foreseeable problem is how to avoid misreadings at the paper folds. The current specification sets out from practical reasons like tape width 297 mm (long side of A4 paper format) and 200 mm fold divisions. 104 channels on 2.5 mm divisions will occupy 260 mm of punched width. This number of channels suffices for my organ except its percussive harp. Possibly the harp can be accommodated using an additional register control, not yet implemented. The divisions measure is motivated by my metric tools for tracker bar and punch fabrication. This format will not coincide with any one presently known, but it is anticipated that music arrangements will anyway be unique to this organ. Until an automated punch device is developed I believe computer MIDI printouts will give templates that are easy enough to use for guiding a manual punch. Because of available space this reader is unusually short in the paper travel direction, about 280 mm over all. This makes it relatively difficult to control the paper sideways position, calling for active devices. In the drawing below the tape is driven from a payoff bin at left, over the tracker bar surrounded by two curved guide plates, into a takeup bin at right. The tape is driven by a rubber capstan extending some 2 mm through a hole in the right guide plate. On top is a bridge, pivoting around its left shaft which also carries a gentle leaf spring to press the tape against the tracker bar. The bridge right shaft carries the 'pinch roller' pressing the tape against the capstan. This is a tube extending the whole width of the tape and is held by ball bearings at its ends. This photo is a general overview of the assembled unit, mounted with ball sliders on two support rails. 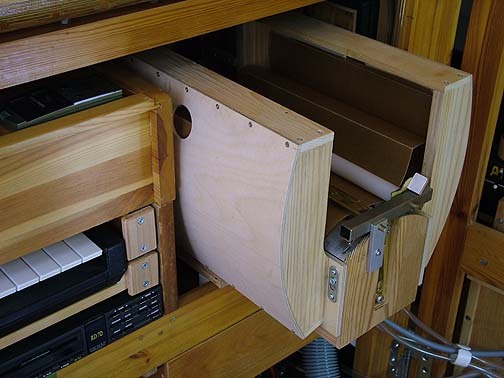 This allows the unit to be pulled out from its storage position in the organ cabinet for easy access. The bins and these rails are keyhole mounted such that they are easily unhooked. The pinch roller axle holds eccentric segments at its ends, resting against the capstan support plate. This axle can be rotated somewhat with a small spoke in order to engage or disengage the pinch roller. The width of the payoff bin is just some 1 mm more than the tape width and is supposed to guide the tape sideways initially. The takeup bin is some 5 mm wider. It is important that the wide paper tape is fairly closely guided near the tracker bar, otherwise it easily wrinkles as it alternately folds up and down. On the entry side this is done by the guide leaf spring, on the exit side by the pinch roller being a long tube rather than just short rollers. The outside curvature of the bins appears essential to make the paper unfold and fold graciously. The tracker bar is made from 20 mm hexagonal alloyed alumin. Its sensing holes are 1.8 mm diameter at 2.5 mm divisions, drilled to the center of the bar. On the back two oblique sides there are continuation holes to connect to the switches. These alternately go to the leading and trailing sides of the bar, such that the connection holes come at 5 mm divisions. The coupling to the two switch rails is with short flexible PVC tubes. After drilling the holes the bar was excentrically put in the lathe and the sensing surface was turned into about 15 mm radius. The ends of the tracker bar are supported by vertical leaf springs such that the bar is easily mobile in its axial direction. Two extreme holes in the tracker bar sense the edges of the paper tape. These holes vent two balancing bellows that are evacuated via bleeds to the suction source. This bellows array is geared with an arm to the tracker bar in order to align the bar with the actual sideways position of the tape. In the present design the bar can move over a range of 3 track divisions in about 2 seconds time. The rocking armature hinges on two central pins and is held in place by a strong crosswise leaf spring, pivoting on brackets. This is a toggle pressing the rocker toward its end positions, a partial compensation for the elasticity of the bellows cloth and the bar suspension. It is easy to take out the various subassemblies like the drive motor gear, the alignment bellows, the curved guide plates, and the bins. Each is fastened to the wooden main frame with two machine screws. Once these units are taken away the tracker bar and the switch rails can be lifted out together. The sideways control of the tracker bar seems to operate well. Still, when the tracker bar is found to go toward one side, then the drive mechanism should make the paper tape wander back toward its correct path. Initially I tried two capstans, one each side of the tape, hoping that direction might be controlled using the pinch roller pressure. In my practical experience this does not work. The double capstan was then abandoned in favor of a single one at the paper center line. The key feature is that the feed direction of that capstan can be controlled to be slightly off axis, in my present experiment up to +/-3 degrees. When the tracker bar is sideways adjusted by the sensor holes and bellows, that same excursion is used to yaw the feed direction of the capstan. After some effort at the drawing board I arrived at the following design which indeed appears to work in the same time as it reasonably simple to make. The motor driven capstan shaft (right of capstan in this drawing) is rigidly supported by ball bearings at both its ends (motor end not shown). The shaft capstan end is approximately ball shaped, resting in a bushing at the center of the capstan. A hole is drilled through this bushing and the shaft and a small pin is inserted. With adequate backlash this implements a half cardan joint. A spoke extends from the other (left) end of the bushing. The far left end of this rotating 'yaw' spoke rests in a link arm that connects its direction to the tracker bar sideways position. This drawing shows the under side of the trailing guide plate which carries the capstan and its control, and also the tracker bar. The red markings show how the capstan is yawed when the tracker bar is displaced leftward by the edge sensors and bellows. These switches are suction-to-electric converters. 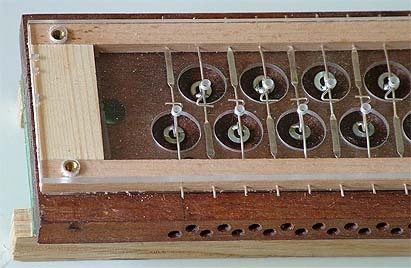 They can be connected in parallel to the present MIDI decoder and serve as an alternate control option. The design is a variation on the recipe by Richard Vance at http://www.mmdigest.com/Tech/vanceSwitch1.html. Initally I tried a small 8 channel prototype in a plexiglass body, 2.5 mm divisions and 8 mm cavities. Dismissed that as too difficult to make and adjust. Then made a short 4 channel copy with 5 mm divisions and 15 mm cavities like shown below, which seems to work OK. Major parts for the complete system are built, but fabrication of contacts withheld until transport design is finalized. To accommodate the totally 104 switches within managable space requires multilevel staggering, the first one is to split from the tracker bar into the two rails. Next level is to alternate between front and back sides of a rail (black and red in the sketch), and finally between an upper and a lower row. The general layout is maybe seen in this sketch of the end of one of the rails. The central part is a 12*80*330 mm mahogany piece with 2*2*13 pouch cavities, 15 mm diameter. On each side, over these cavities is a 1.5 mm plexiglass plate with a glued-on wooden frame to carry the contact wires. These plates are drilled in the same operation as that for the underlying cavities. The pouches are formed by a coherent sheet of pouch leather (red below), compressed without glue between the 1.5 mm sheet and the wooden base. Outside this are 3 mm plexiglass plates carrying contact adjustment screws in threaded holes, and finally wooden bars to hold the complete assembly together. The inner sides of these bars are made slightly convex in order to distribute their compression force more evenly along the rail - there is little room for compression screws except at the ends of the rails. This drawing shows more detail on one single switch, for clarity neglecting its neighbors. The photo is from before adjustment screws and pouch leather are installed. The internal volume where the contact springs are located is connected to the suction source. For each cavity there is a 0.8 mm bleed hole drilled through the 1.5 mm plexiglass, leading to the channel toward the tracker bar. It is a fairly exacting operation to perforate and mount the pouch leather sheet to match with these bleed holes. The contacts are made from 0.8 mm sterling silver wire. Each contact is two parts, one 'fixed' albeit adjustable with a screw, and one moving with its end actuated by the pouch. The stem of the moving contact is flattened into a leaf spring, 0.25 mm thickness. This flattening is done using a steel bar with thickness control shims added. The contact wire is placed between that bar and an anvil and the bar is hit with a sledge hammer. Hammering is repeated until a micrometer or caliper tells the correct thickness has been reached. The end of the moving contact is bent and tin soldered to a small washer that rests on the middle of its pouch. After preliminary shape adjustment the contact wires are locked in place in their mounting holes with cyanoacrylate glue. When the tracker hole is covered, then the whole unit is under the same suction, the contact spring presses the pouch into its cavity and the contact is open. With an open tracker hole only the contact cavity is under suction and the pouch lifts the contact spring until it makes to its fixed counterpart.